INTERCONTINENTAL STADIUM. 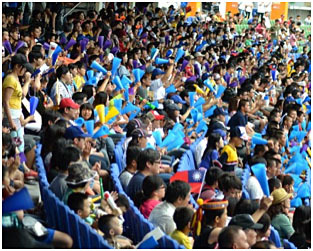 Japan downed Chinese Taipei 4-1 on Sunday afternoon in the first game at Intercontinental Stadium in Taichung, handing the hosts of the XXVI 18U Baseball World Cup a loss in their tournament opener. Great pitching, solid defense and timely hits helped Japan to earn the win. Especially the efforts of starting pitcher Yuki Matsui made the difference. The southpaw allowed just three hits, a run and seven walks in eight innings, while striking out 12. He faced his most difficult situation in the bottom of the eighth, when Team CT loaded the bases with two outs and Ming-Yu Peng ran the count to three balls and no strikes. But Matsui responded by punching out Peng to keep Japan ahead. Japan broke a scoreless tie in the top of the fourth, when Tomoya Mori scored on a single by Satoshi Sonobe. A RBI single by Nobuyuki Okumura in the sixth and a pair of safety squeezes in the eighth and ninth plated three more runs. Chinese Taipei was hitless against Matsui through the first five frames before Li Lin broke up the no-no bid with a leadoff single in the sixth. They only were able to score in the eighth on a RBI double down the line by Chia-Wei Yang and had to settle for the loss. On Monday both teams will be back on the field for two games each. Japan is in Dou-Liou and squares off with Mexico in the morning and with Venezuela in the evening. Chinese Taipei takes on the Czech Republic in the morning and Mexico in the evening – twice at Intercontinental Stadium. YANG Y faced 1 batter in the 7th.